Pleio continues to seek “GoodStarters” — If you’re looking for a side gig and you like to help people get better, Pleio, an established company, continues to list its GoodStart Mentor positions. Training is provided (unpaid, as you’re an independent contractor rather than an employee). Average pay is $14 – $18/hr., the company says, though GoodStarter reviews say the average is $17 – $21/hr. You’ll be helping patients get into a good routine with their medication, via phone. No sales, no medical experience needed. Workflow may vary, so you should probably view this as side income rather than a main job. 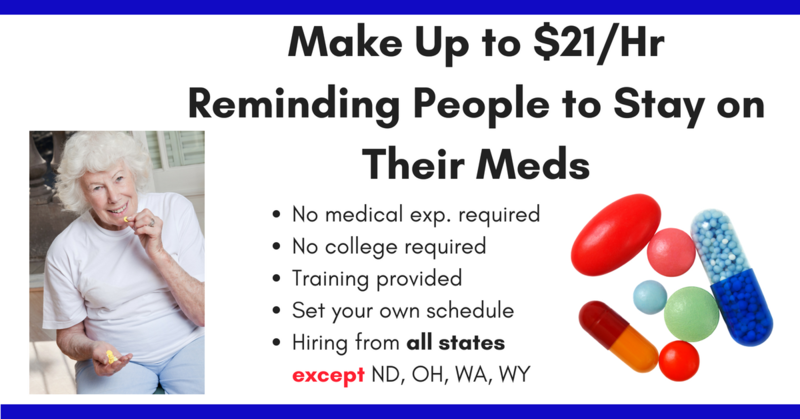 A person starting a new medication signs up for the GoodStart Program at their pharmacy because they want to make sure they’ll be using it correctly. You, the GoodStarter, make non-sales outgoing calls to those folks who signed up. (Don’t worry — you will NOT be giving medical advice.) During those calls, you’ll work from a script that reviews the side effects of the drug and reminds the patient of the routine for taking it. You’ll also listen to the patient and report back any adverse effects the patient may have mentioned. Requirements include a landline phone, PC (Macs not supported) and DSL or cable internet. No doctors, nurses, pharmacists or pharmacy technicians accepted. No college required. As mentioned, you’ll be working as an independent contractor rather than an employee. Once you’re invited to train, you’ll need a credit and background check ($45). “A low credit rating will not automatically disqualify you,” the company says. To go to the job listing, click here. For the FAQ page for GoodStarters, click here. Pay is monthly by direct deposit. For more jobs like these, check our Newest Jobs & Gigs page. To be the first to hear about jobs like these, like our Facebook page and check your feed for our posts. May you be working from home soon! This entry was posted in Independent Contractors, Jobs That Don't Require a College Degree, Work at Home Jobs and tagged GoodStarter, Pleio. Bookmark the permalink.